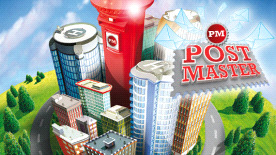 In Excalibur’s Post Master you’ll start out with a single post office, supplying pick-up and delivery services for a small area of the city. To maintain an excellent service you’ll need to hire workers to sort mail, contract security guards to protect your offices from robberies while also purchasing new vehicles to pick up and deliver mail. Once you’ve settled into your first office, you’ll need to look to the future of your company and determine the best plan of action to expand your services. Will you look to provide the best mail distribution system but supply a small area, or are you looking to conquer the city with several offices and a vast fleet of vehicles. In order to maintain your claim on postal services for parts of the city, you’re going to need to remain competitive. With a rival business looking to take a cut of the services there are methods of attack to remain the superior mail distribution business. You can carefully plan your delivery routes to make your average delivery time faster than anyone else, or you could lower the prices of your services to remain the cheapest.